Is WordPress the right choice for your business website? Firstly a disclaimer: for nearly 8 years, we’ve worked almost exclusively with WordPress. WordPress is a great fit for our clients needs, how we work, and our ethos. However it is certainly not right for every scenario. If you are looking to create a great looking, mobile friendly website, with an easy-to-use content management system (so you can manage the website content yourself), then WordPress may well be the tool for you. That’s not to say that WordPress can’t handle more technically challenging websites – it certainly can. To help, WordPress has the concept of “plugins” where we can install extra functionally into your website to make it do more. There are all manner of plugins, from event calendars, to ecommerce shopps, to something as flippant as snow falling effects. Note about plugins! I always shudder at the word ‘plugin’ as I think it gives the wrong impression. It makes it sound like it’s as simple as Lego: “want an eCommerce shop? Just click in a plugin and away you go!“. It’s rarely that simple – many plugins need a lot of configuration and customisation. However, I’m not trying to be doom & gloom here; plugins are much better than having to write everything from scratch – just don’t let the word ‘plugin‘ mislead you. Plugins only get your so far – if you have unique requirements which existing plugins do not cater for then you need to make a decision. Are you happy to tailor your needs to fit existing plugins? Or do you wish to commission (potentially expensive) bespoke programming. We can help with either case, but the choice is yours. WordPress also has the idea of “themes”. Themes control how a website actually looks. And, because WordPress is so popular, there are countless, off-the-shelf themes available. This means that, if you chose to, you could use a pre-built design for your business website. Word of warning though: just to let you know, on 99% of our WordPress projects we do NOT use an off the shelf theme. Why? Because we believe that your business is unique, and what makes you special, your products and services, your brand, your messaging etc is also unique to you. If you try to force that uniqueness into a pre-baked theme, something will get lost in translation – and that loss can be very costly. What we prefer to do is to work with you to create a design which is completely bespoke to your business – a design which is built from the ground up to resonate with the exact messaging needs of your target audience – yes the level of investment is greater, but you get better results. On the other hand, sometimes budget dictates that using a theme is the way to go. No, WordPress technology also powers huge, high traffic sites such as Time.com, The Sun, The Metro and many more. Hmm….well, the underlaying WordPress software is free to download but that doesn’t then mean that any project which uses it is free/cheap. We are experts in developing with WordPress, and we have a tried and trusted process for delivering results for our clients. Clients can gain access to that expertise; for a certain level of investment. No. WordPress sites can be zippy fast – we always take strides to ensure that. However, the blessing of WordPress is also a curse, it doesn’t take a degree in advanced computing to install WordPress and then install all manner of themes/plugins – and, if this is not thought through carefully, it can have a significant negative performance impact. Same point as above really but with a few other things to mention. WordPress is open source software and is as open to hacks as any software is, however, the beauty of open source means that issues are discovered quickly (as many eyes see the website code), and fixes are released quickly. When looked after well, WordPress is a very secure platform for websites – we’ve blogged into our approach with WordPress and security before. WordPress is a very popular platform – which means that there are lots of web designers, and web design agencies out there who can help service your needs; you are not locked in to a particular agency – this is good for your business. WordPress is a very popular platform (didn’t I just say that?) and chances are that some of your team will already be familiar with using it. This lessens the learning curve and gets the project rolling along even more quickly. p.s. if you’d like us to help review your website, or put together a spec for a new website design project, please get in touch. 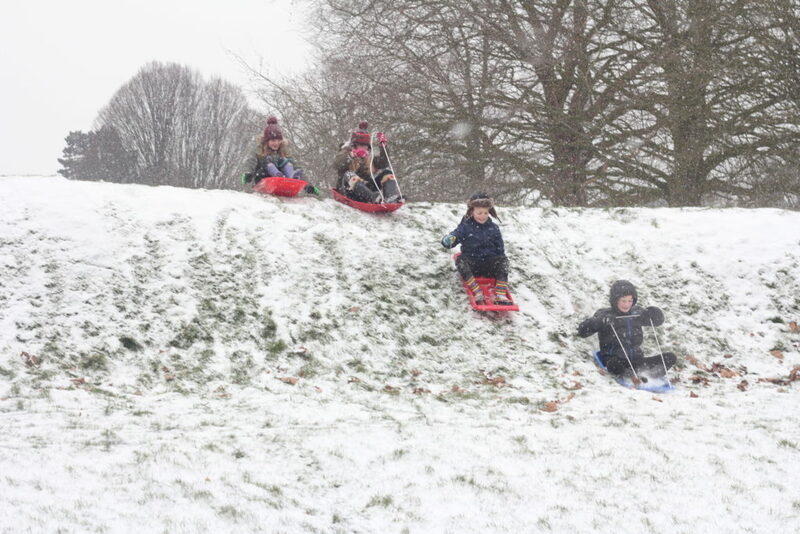 p.p.s this post’s ‘random header image‘ is of my kids and their friends enjoying the recent wintry conditions.